The Studio Suite is a cosy, self-contained, studio apartment set-up suitable for a single person or a couple. It comes equipped with a queen sized bed and an ensuite with shower and bath. The kitchenette, living and dining area looks out, through a picture window, to views overlooking the city and the hill suburbs beyond. The Studio Suite is non-smoking and has its own private entrance. Maximum occupancy of 2 adults. The unit is not suitable for children. We serve a set Continental breakfast which consists of bread rolls and toast with a selection of spreads and conserves – jam, marmalade, butter, peanut butter, honey and cheese. 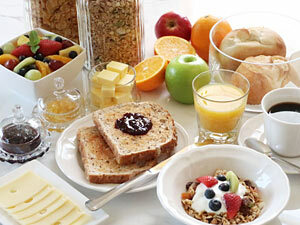 In addition, we provide milk, cereal and toasted muesli, yoghurt, fruit salad and fruit juice. Plunger coffee, a selection of teas and hot chocolate are always on hand. If you have any special dietary requirements (e.g. vegan, gluten intolerant or food allergy) please inform us well in advance, preferably at the time of booking, to discuss your requirements. Please note that there may be a surcharge to the tariff for sourcing speciality items. © 2019 Austinvilla Bed & Breakfast. All Rights Reserved.